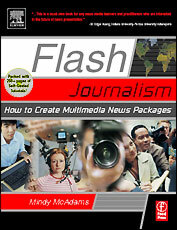 In 2004 I wrote a book titled Flash Journalism: How to Create Multimedia News Packages. It was published by Focal Press/Elsevier in April 2005. This was the Web site for that book. I have continued teaching Flash to journalism students at the University of Florida through all these changes, but I have decided it's not practical for me to update my book. For new content and new examples -- using Flash CS4 and later, and ActionScript 3.0 -- follow the links at the top of this page: Animation and ActionScript. For handouts and other helpful materials for teachers, see Educators. For current professional examples of Flash journalism, see Examples. To learn more about me, see my home page. To teach, I'm using Adobe Flash Professional CS5 Classroom in a Book. I'm adding a lot of instruction to what's in the book. In the interest of sharing with the journalism community, I offer many of those examples and tutorials here. If you're looking for the old pages from this site, they are still here.